Makoma Lekalakala and Liz McDaid built a broad coalition to stop the government’s massive ‘secret’ nuclear deal with Russia. South African Breweries has honoured activists from Earthlife Africa, Makoma Lekalakala and Liz McDaid, at its 30th annual media and environmentalist of the year awards. The pair on Tuesday received the Nick Steele memorial award for their work in winning a crucial court case to halt plans by the South African government to proceed with a national nuclear build programme. Lekalakala and McDaid built a broad coalition to stop the government’s massive secret nuclear deal with Russia. 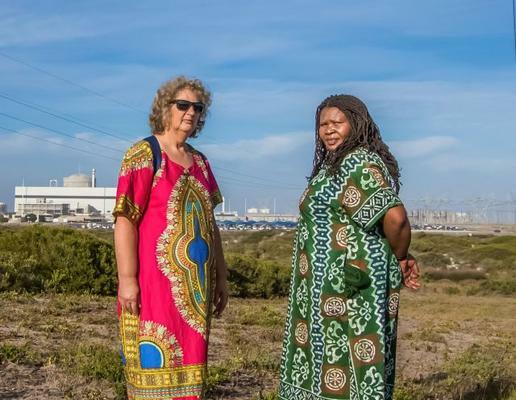 In April 2017, the high court ruled that the $76 billion nuclear power project was unconstitutional, a landmark legal victory that protected South Africa from an unprecedented expansion of the nuclear industry and production of radioactive waste. SAB also awarded several journalists for excelling in reporting on environmental matters in the categories of video, audio and written media as well as photography. “Recognising and rewarding work by the media is an important part of making sure that big business, governments, communities and individuals take accountability for their actions, which have an impact on the environment,” said Katopodis. SAB and AB InBev Africa vice president for procurement and sustainability David Hauxwell said the company had never shied away from its impact on the environment and the communities in which it operates. “We acknowledge the responsibility that we have towards preserving and protecting our natural resources, minimising our impact and making a substantial and real contribution to building the future of all,” Hauxwell said. SAB and AB InBev this year announced their sustainable development strategy outlining their joint priorities for 2025, with key areas of focus being water, agriculture, climate change, and circular packaging. At the awards, SAB announced a legacy award recognising community-based environmental projects to be handed out from 2019. “The legacy award will help those on the ground make a difference in communities that are affected, more than most, by daily environmental challenges,” said Hauxwell. More than 200 entries from media were received for the 30th edition of the awards.